In Sept., 1992, enrollment for Science A-17: “The Astronomical Perspective” was not as sky-high as professors Owen Gingerich and David W. Latham would have liked. Some faculty might have called it a day and commenced firing excess teaching fellows—but for Latham, the fun was just beginning. After downgrading from a skywriter to a banner-bearing plane (the skywriter was all the way in Newark, N.J.) and securing a half-price deal, it was only a matter of time before the simple message—“Sci A-17. M, W, F. Try it!”—rippled above Harvard Yard for all to see. “The amazing thing was that Harvard students aren’t used to looking up, so very few students actually noticed the plane with the banner,” Gingerich said. In the 1960s, this same spirit inspired Latham to spearhead the relocation of the Michael Telescope from Bucyrus, Ohio to its current home atop the Science Center in the Loomis-Michael Observatory. The observatory, ten stories high and brimming with vibrant paintings of astrological signs and symbols, is now accessible to anyone in the Harvard community who attends a short training session. But since its installation, the observatory has been more than a scientific tool. Over the years, the dome perched high above campus has become a cross between an educational resource and a social space—playing host to amateur stargazers and poetry readings, study breaks and pre-Formal photo-ops, as well as an aging log book with messages from all the visitors who have passed through the observatory since 1976. Charles Michael was an avid astronomer, so for Christmas one year, his father Walter presented fifteen-year-old Charles with a telescope all his own. The enormous telescope was conveniently stored in the backyard observatory of his family’s Bucyrus, Ohio estate. When Charles went off to college, the telescope fell into disuse and his father—head of the Ohio Locomotive Crane Company­—bequeathed it to Harvard University. But before the construction of the Science Center in 1973, the University had nowhere to house the nearly four-meter, cast iron instrument. “Walter Michael asked every year, politely at first, ‘when are you going to come get your telescope?’” recalled Latham, who was a graduate student at Harvard at the time and is now an Associate of the Harvard College Observatory and a lecturer on astronomy. 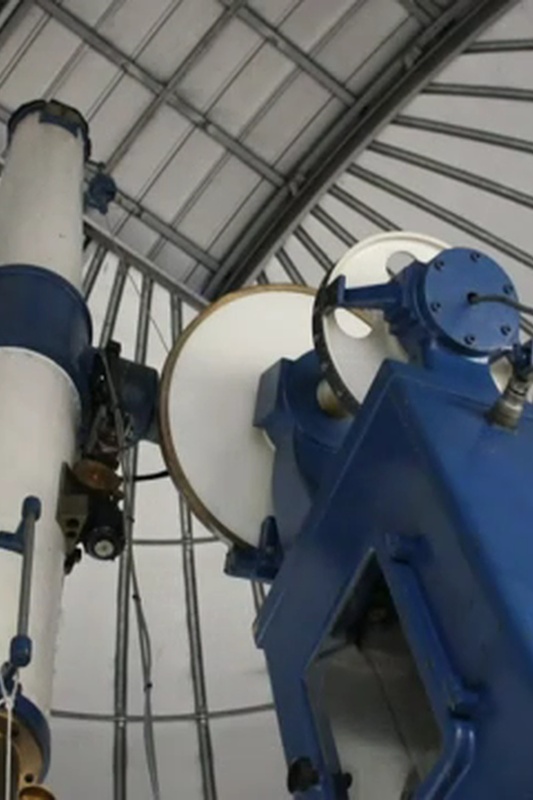 Once space was set aside in the Science Center, another obstacle arose—the estimated cost for transporting and installing the telescope was astronomical, so to speak. If not for Latham, the story might have ended there. “[Latham] decided he could personally get the telescope here for half the estimate of Buildings and Grounds, so he was commissioned to do it,” said Gingerich, referring to the Harvard department that would have been responsible for the relocation. Gingerich is professor emeritus of astronomy and of the history of science, and a senior astronomer emeritus at the Smithsonian Astrophysical Observatory. Latham zipped over to Ohio, and, with a few local vendors and a hired crane, lifted all the telescope sections out of Michael’s garden. He drove the pieces to Cambridge in a rental truck, all the while contemplating how he would lift them to the tenth story of the Science Center when the elevators only reached floor number eight.